Looking to do a Performance Improvement head swap on your Mustang? We've made sure to mark parts that work with these heads, whether yours came installed from the factory or have been added to an older model. Our huge selection of aftermarket and specialized 99-04 Mustang GTparts is sure to amaze the avid fan in you. Read on and see what Anderson Ford Motorsport has in store for you. Since we opened our doors in 1989, Anderson Ford Motorsport has specialized in Mustangs. We don't just sell aftermarket parts; we've been working on these cars since they were released, testing, developing and selling parts to get the best performance possible. Our goal is to help you achieve the driving experience you want, no matter where and how you drive. We keep innovating to meet the growing demand for better performance parts. We know the market and we offer our products at affordable prices. A huge range of products combined with convenient pricing – what else can you ask for? Do you need more power and speed on the track or better handling and comfort while touring the scenic roads of Illinois? Let us know and we’ll help you find the right components. We have everything for the 99-04 Mustang GT owners. We even develop our own parts, which you can’t find anywhere else. If you need a side exhaust, an anti-roll bar, a brake kit, or just about anything for your Stang, Anderson Ford Motorsport is the name you can trust. For the model's 35th anniversary, Ford released an updated version of the SN95 Mustang, bringing New Edge styling. This replaced the rounded look of earlier fourth generation Mustangs with a meaner, sharper look on the outside, but the inside carried over with hardly any changes, as did the transmissions and most of the suspension. On the mechanical side, most of the attention was paid to the base V6 engine, but that's not to say the GT's V8 was left alone. The 4.6 liter received the "Performance Improvement" (PI) package including new heads, cams and an intake manifold for better flow. Power rose to 260 hp and 302 ft-lbs. of torque, 35 hp and 12 ft-lbs. more than the '98 Mustang. That was enough to cut 1/4 mile times by about half a second. Today, PI parts are sought after by owners of older Mod Motor-powered Mustangs as a cheap factory upgrade. Two models were offered that increased the GT's performance. 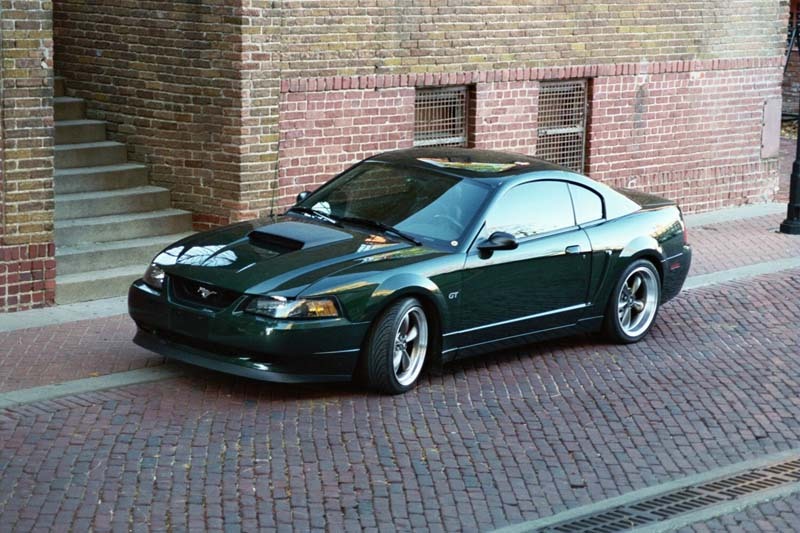 In 2001, the Bullitt edition, named after the famous car chase film, offered some tweaks including a lowered suspension, subframe connectors usually reserved for convertibles, Tokico shocks, and the brakes used on the Cobra. An improved exhaust and intake increase output by 5 hp. By '03, the Cobra was using a supercharged engine, but the naturally aspirated twin cam motor was reused in the Mach 1. This version uses the supercharged Cobra's heads, but output dropped to 305 hp, 15 hp less than the 2001 Cobra. Among its retro styling details is a functional shaker hood scoop. Other special editions like the Ford's 100th anniversary edition leave the GT's mechanicals untouched. Like other Mod motors, the V8s used in the '99-04 GTs respond well to intake and exhaust flow improvements. Through extensive in-house testing, we've created power packages that help your motor breath freely and deliver reliable performance gains. If you're looking for something more extreme, we have the parts for that, too, from nitrous kits to high flow heads. Browse our inventory to view your options and find the items you’re looking for quickly. If you have any questions about our products, please call us at 888-715-6487.